Paul Solomon could see into the future. The message of his Prophecies is clear- unless we dedicate ourselves to a new age of global Unity devastating results foreseen by the Source will come to pass. 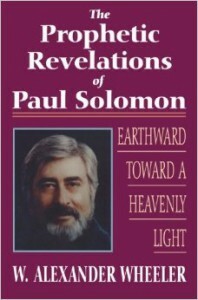 The message of the Paul Solomon Source is empowering and hopeful. We can chose to avert disaster by respecting the Earth, uniting globally to seek diplomatic resolutions to conflict, and by changing habits of greed and self-interest that have influenced our decisions for the last hundred years. Solomon shares these Source readings so that we may quickly realize our own power to shape destiny. Dr. W. Alexander Wheeler puts these Revelations into context with information from other prophets, both ancient and modern, along with wisdom from Eastern, Western and Native American spiritual traditions.